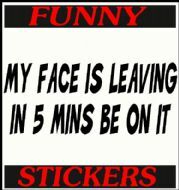 Looking to add your own bit of humour to your car ? 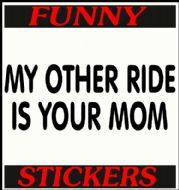 These funny car decals will get a laugh out of most people in the car behind you. 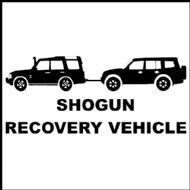 The funny car decals are made from high grade weatherproof vinyl and will last for years. You can apply the decals on the outside, or you can choose to apply the decals from inside the glass. 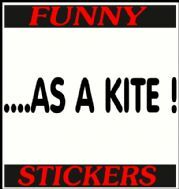 Great bumper stickers , with a joke to suit most ! 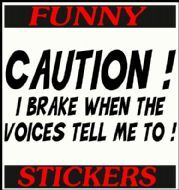 CAUTION I BRAKE WHEN THE VOICES TELL ME TO! 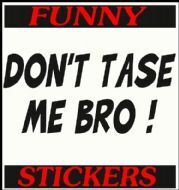 DON'T TASE ME BRO ! I LOST MY TEDY BEAR ! CAN I SLEEP WITH YOU? 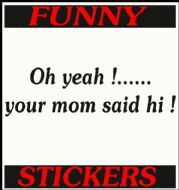 OH YEAH !........YOUR MUM SAY'S HI ! 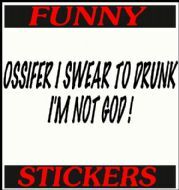 OSSIFER I SWEAR TO DRUNK I'M NOT GOD ! If you can't find the vinyl decal that you are after then you can always contact us via the chat icon or send us a message.We are continually designing custom car graphics,and although we update the site every week,there are always questions of "can you do ....?" ...of course we can ! just ask us! The logos included on this website may or may not be the trademark or registered trademarks of their respective companies and are provided as a convenience only for their lawful use.It is the expressed intent of Cheeky Chappie Decals that any unauthorized use of the items by the person selecting them shall be the sole responsibility of that person only.The selection of the items from this website is not an authorization for the use of the said logos or trademarks, but by selecting any item you are indicating that you have the authority to use the item.